Jenice has established her career as a leader in the small business development, nonprofit and healthcare industries, directing new initiatives and coordinating organizational efforts to execute key business strategies. Complementing her ingenuity with written and verbal communication as well as thorough research and business management, Ms. Contreras has found success in many realms. In her current role as Executive Director of the Hispanic Business Center, Jenice is responsible for establishing and/or strengthening relationships through multiple business development agencies by establishing strategic partnerships and ensuring high-quality programs necessary to carry out the mission of the organization. Prior to this new role, Jenice served on the Board of Directors since 2006. Formerly, Jenice worked as a Public Health Consultant with Collaborative Research, LLC who is dedicated to supporting local municipalities across 13 states with the administration of Federal grants through the Health and Resources Services Administration (HRSA). In this capacity, Jenice was responsible for the facilitation of program planning councils as well as the development and implementation of quality improvement programs. Prior to her time with Collaborative, Jenice was Director of Development and HIV Services for Care Alliance Health Center, a Federally Qualified Health Center focused on addressing the healthcare needs of individuals experiencing homelessness or living in public housing. 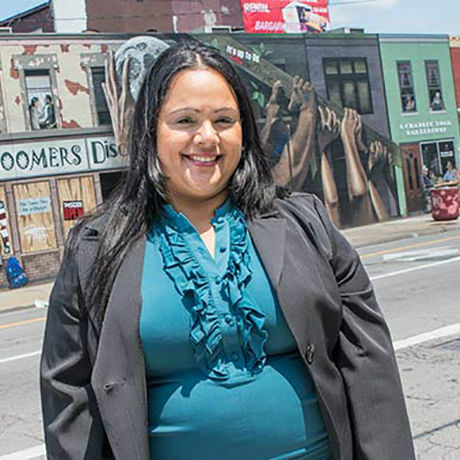 Stemming from her dynamic involvement with community programs and success in pursuing funding, Ms. Contreras is dedicated to her personal initiatives and remains a strong leader in the community. Ms. Contreras is bilingual and bicultural and is extensively involved in minority leadership efforts in her community. Jenice earned her Bachelors of Arts degree from Capital University an Executive Master of Business Administration from The Ohio State University, Fisher College of Business. She is appointed by Mayor Frank Jackson to serve on the City of Cleveland, Community Relations Board. We’ve been roasting coffee in Cleveland for over 20 years, building community and coffee culture in the process. We operate four cafés around Cleveland, roast coffee for over 100 wholesale customers around Cleveland, and do private coffee and espresso catering. We’re part of the reason that Travel & Leisure magazine named Cleveland one of America’s best coffee cities in 2014. EvergreenPodcasts.com features a myriad of entertaining podcasts, rooted in high creative values and production quality. Evergreen is a community where people think big. We love capturing the color and diversity of modern makers. From entrepreneurs and musicians, to philosophers and artists – we are in the business of uniting audiences with boots on the ground storytellers.